Junior RHP Addison Russ has dominating outing for Huskies. EDINBURG, TEXAS (February 28, 2016) HBU junior righthander Addison Russ took a no-hitter into the eighth inning and the Huskies’ bats came alive in a 6-2 victory over UT Rio Grande Valley in the Al Ogletree Classic Saturday night at Edinburg Baseball Stadium. Russ (2-0) allowed two runs on four hits with six strikeouts and a walk in seven innings. He had held UTRGV hitless through seven, until allowing four-straight singles to lead off the eighth. Senior righthander Matt Harding earned the first save of career, throwing a perfect final two innings. Junior centerfielder Joe Van Marter went 3-for-4 with a pair of doubles, an RBI and a run, while senior second baseman Greg Espinosa went 2-for-5 with two doubles, an RBI and two runs for the Huskies (4-3). Junior rightfielder Brandon Brintz went 2-for-5 with three RBIs and senior first baseman Andrew Alvarez went 2-for-4 to extend his hitting streak to seven games and his reaching safely streak to 17. Senior shortstop Louie Payetta also went 2-for-4. Edgar Cordon, Isaac Gonzalez, Manny Loredo and Caden Rosholt had the four singles for UTRGV (2-5). Ryan Jackson (0-2) took the loss for the Vaqueros, allowing six runs, three earned, on nine hits with three strikeouts and two walks in 4.2 innings. Zach Martinez, Luis Larrinaga and George Lamb combined for 4.1 shutout innings in relief. Espinosa led off the game by slapping a double down the rightfield line, then Payetta and Brintz followed with singles to give the Huskies a 1-0 lead. With two outs in the fourth, senior third baseman Justin Monsour beat on an infield single, Van Marter reached on an error, then Espinosa blooped an RBI double to shallow left. Payetta walked to load the bases, then Brintz ripped a two-run single to right to extend HBU’s lead to 4-0. Junior catcher Blake Thomas walked to lead off the fifth, then junior designated hitter Christian Thames blasted a double to left. Monsour brought another run home with a sacrifice fly, then Van Marter’s RBI single to left made the score 6-0. Cordon pinch hit to lead off the eighth for UTRGV and singled to right to break up Russ’s no-hit bid. Gonzalez also pinch hit and bounced a single through the right side. Loredo singled to load the bases, then Rosholt’s RBI single fell just out of the reach of a diving Van Marter to cut the lead to 6-1. Harding came in and got Joseph Callazo to ground into a double play, which plated another run, but Austin Douglas stuck out looking to end the threat. Harding then set down the Vaqueros in order in the ninth to preserve the win. HBU wraps up the Al Ogletree Classic against Washington State Sunday at noon. The Legacy Sports Network broadcast with Russ Reneau can be heard at 11:45 a.m., beginning with the pregame show, on HBUHuskies.com. Fans can also watch the game via Periscope on the official HBU Athletics Twitter page, @HBUHuskies. The link for the Periscope broadcast will also be available on the “live video” link for the game on HBUHuskies.com. HOUSTON, TEXAS (February 22, 2016) The Houston Baptist University Huskies made an attempt at a comeback late in the second half, but fell short has they dropped a 97-91 decision to the Incarnate Word University Cardinals at Sharp Gymnasium in Houston on Monday, February 22, 2016. 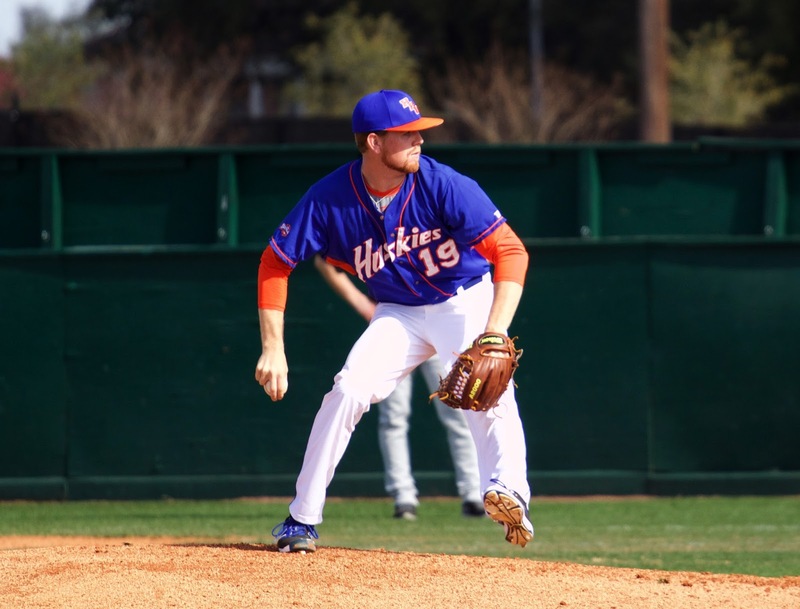 The loss dropped the Huskies to 10-5 in the Southland Conference and 16-12 for the season. The Cardinals raised their conference record to 9-5 and 14-11 for the season. The Huskies and the Cardinals battled back and forth the entire first quarter, with neither team able to gain an advantage of any significance until the final five minutes of the first half. Incarnate Word when on a 20-13 to take a 51-43 lead into the locker room at halftime. Starting forward Colter Lashertallied 13 of the HBU’s first half points with Cody Stetler adding 10. The Cardinals had three players scoring in double figures in the first half. In the second half, HBU was able to outscore the Cardinals 48-46, but it was not enough to overcome the Cardinals’ first half effort. The Huskies had four played score in double figures for the came, with Lasher finishing the contest with 24 points. Anthony Odunsi paced HBU with 25 points, with Stetler adding three points in the second half to go with his ten points from the first half. Caleb Crayton came off the bench to add 10 to the effort. The Cardinals had five players in double figures with Derail Green leading the way with 23 points. They shot 62.5% from the field and 50% from three-point range, which was a season high for HBU opponents. Next up for HBU is a February 27 matchup against the SFA Lumberjacks. Tipoff is scheduled for 6 p.m. CST in Nacogdoches. HOUSTON, TEXAS (Sunday, February 21, 2016) The United States capped their fourth consecutive CONCACAFWomen’s Olympic Qualifying Championship at BBVA Compass Stadium in Houston, Texas with a 2-0 win over Canada in the final match of the tournament. Both the United States and Canada will advance to the Games of the XXXI Olympiad in Rio de Janeiro, Brazil in July-August, 2016. The game started out with both teams trying to find the weakness in each other’s defense. It was a battle, moving from one end of the pitch to the other with neither team able to get an advantage. The game continued as a defensive battle without either team finding the goal in the first half. The only event in the first half was Canada’s Josee Belanger receiving a yellow card. The starting defender, who plays professionally for the Orlando Pride was cited for aggressive play. The USA finally found a way round the stubborn Canadian defense in the 53rd minute. Midfielder Lindsay Horan beat goalkeeper Stephanie Labbe to the ball and sent it out to defender Becky Sauerbrunn. She immediately sent the ball back to Horan, who headed the ball pass Labbe for the score. They added an insurance goal in the 61st minute when starting midfielder Tobin Heath connected from 25 yards out on the right side. Both teams will advance to the 2016 Summer Olympic Games in Rio de Janeiro, Brazil. The two teams met twice previously in the finals of the Olympic qualifying tournament. In 2008, the United States came out on top, as a result of penalty kicks. With no score after regulation, they played two overtime periods with Carli Lloyd scoring for the USA in the 108th minute and Melissa Tancredi scoring the equalizer in the 116th minute. The game went to penalty kicks after 120 minutes of play with the USA coming out on top 6-5. In 2012, the USA shocked Canada 4-0 with Alex Morgan and Abby Wambach each scoring two goals in the win. HOUSTON, TEXAS (February 6, 2016) Leading by one point with the final period to play, the Houston Baptist University Huskies were unable to contain the fourth period scoring of Stephen F. Austin and fell to the Ladyjacks by the score of 64-50 at Sharp Gymnasium in Houston on Saturday, February 6, 2016. The Huskies fell to 5-6 in Southland Conference action while SFA climbed to 5-5. The Ladyjacks held a 16-14 advantage after 10 minutes of play and took a 30-29 lead into the locker room at halftime. The Huskies outscore SFA in the third period 14-12, but the fourth period was the deciding factor. 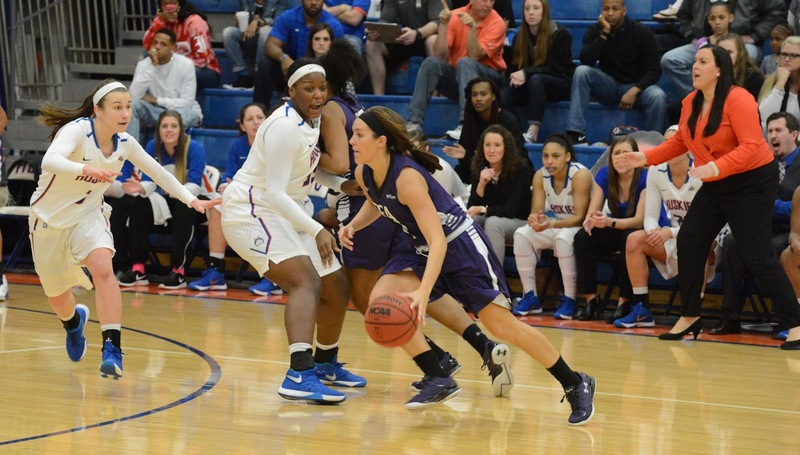 The Ladyjacks outscored HBU 22-7 in the final period to secure the win. HBU starting forward Monet Neal connected for 18 points, while Heidi Sihvola added 13 from the bench. Starting forward Anna Strickland pulled down 11 rebounds and tallied four assists. For SFA, starting guard Taylyor Ross hit for 25 points with Chanell Hayes adding 12. Kennedy Harris added 10 rebounds to her season total. The Huskies have seven games remaining in the 2015-16 season with their next matchup occurring on Wednesday, February 10 with a 7 p.m. CST contest against the Lamar Cardinals. They will then hit the road for two games before returning to Sharp Gymnasium to face Abilene Christian on February 24. They will hit the road to again face the Ladyjacks on February 27. Their final two home games will be against Texas A&M-Corpus Christi on March 3 and Incarnate Word on March 5. The Southland Conference Tournament will be held on March 9-13 at the Leonard E. Merrell Center in Katy, Texas.